We had unexpected snow two days in a row this past weekend and I thought I would take one picture while it was snowing so as to have a picture with snow effects. Two weeks ago, I did not take pictures because it was snowing but I liked all the snow effect pictures I saw in blog land and decided to brave the snow with this one. Polka dots are still a favorite of mine. 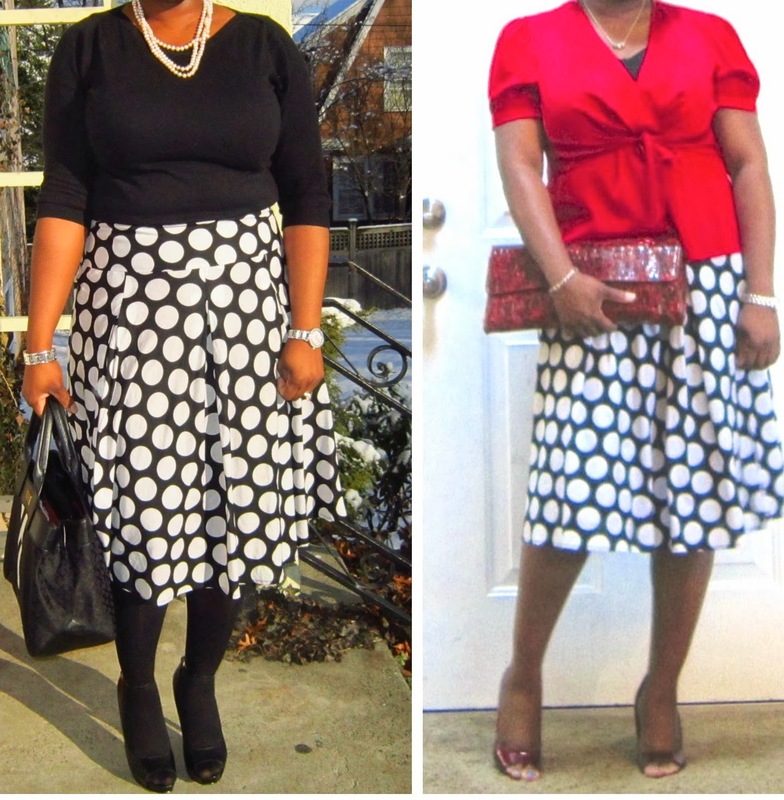 This skirt is really old and at some point I thought it was no longer trendy to wear polka dots. I paired it previously with a red top and here, I'm doing all black and white with this plain black sweater. A plain sweater is a great piece to invest in because it can be easily accessorized and paired with anything like I did here, and stretches your wardrobe. And now for the giveaway! I'm joining up with 11 other fab bloggers, to give away $410 cash for Valentine's Day! Stop by their blogs and say hi, and enter through the Rafflecopter widget below. Good luck! Thank you. Nice working with you on this giveaway. The polka dots are so classic! You are brave for going out in the snow without a coat! Very cute skirt! I love it! Such a classic look! You look lovely in polka dots. Wow! What a great giveaway! Fingers crossed! This is gorgeous polka skirt!